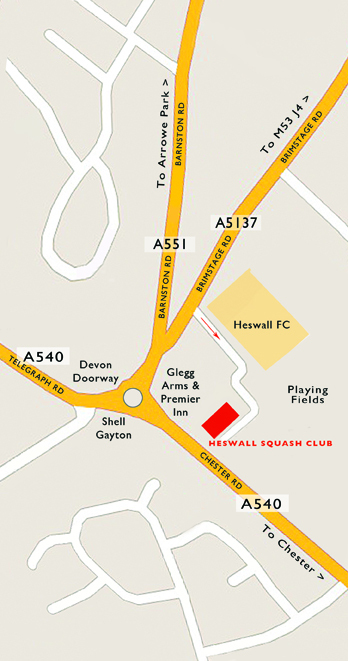 Welcome to Heswall Squash Racquets Club - 45 yrs & still going strong! Based on the Wirral peninsula, centrally placed between Liverpool and Chester, Heswall Squash Racquets Club (HSRC) is recognised as one of the best equipped, members' Squash & Racketball clubs in the North West of England. We have 4 courts (one glass back), 6 mens & 2 ladies squash teams competing in the North West Counties Squash League, active box leagues and, a well stocked bar & function rooms. The Bar & Function Rooms are available for hire and provide comfortable and friendly surroundings for all sorts of events: birthdays, anniversaries, children's parties and even business meetings. The Club kitchen area has recently been completely refurbished and is available for you, or your choice of caterer, to use as part of the total room hire package, all we ask is that the kitchen is left clean, tidy & all food is removed when your event is finished. HSRC is also home to: The Pensby Runners Club, The Heswall Model Aircraft Club, The Heswall Anglers Club &The Heswall Folk Club. New members are ALWAYS most welcome, regardless of age, squash experience or ability, find more information here. "mix-ins" on Sunday evenings are ideal for a gentle knock about & run around. We can pair you up with a squash "mentor" or, if you prefer more formal or advanced instruction, we have a number of England Squash qualified and registered coaches available for group and one-to-one coaching. At Heswall we are really keen to promote squash & racketball to all ages & abilities and we have dedicated sessions for Junior squash on Sunday afternoons! Some of the Heswall Ladies celebrating their league successes in 2014-2015 season! ​Click here for Membership details! Click here for the latest news & upcoming events! Why play Squash & Racketball? 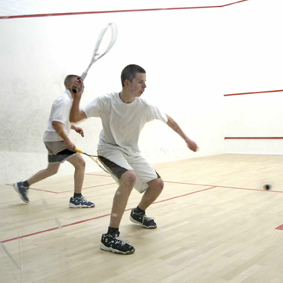 Playing Squash burns between 600 - 900 calories an hour! MUSCLE, BONE & CARTILAGE HEALTH. Squash is well known for its quick bursts of movement, rapid stops and change of direction. Done properly (with attention to good warm-up, warm-down and stretching techniques) such movements introduce an amount of stress on your muscles, bones and cartilage which will lead to a desired increase in strength, stability and reduce your chances of future injury. However, as with most sports, appropriate precautions must be taken. Squash and Racketball are great aerobic exercises! Thinking quickly under pressure, analysing your game, sussing out your opponent's strengths and weaknesses - Squash is often described as "physical Chess"
Squash doesn’t discriminate - strength and size aren't the most important factors in this game. However, being able to think on your feet, hit a ball well, judge your opponent and vary your tactics are essential qualities! The Club has everything it needs for small and large scale entertainment parties, celebrations and meetings. Kitchen with oven, microwave etc. "Fantastic game! I've been playing for about 18 months, thinking that my squash career was coming to an end - but no, my knees now let me play both! The beauty is, that in squash, someone a chunk better than you can stuff you 27 - 0 but in racketball you can still make a go of it and both get something out of it. Some more of you should give it a go & it's definitely NOT instead of squash, it's AS WELL as squash!" Racketball is also great for people who: fancy a different challenge, want a more aerobic but less high impact sport, are recovering from injury or just find squash a little over demanding. The bigger racket head and larger, more bouncy ball gives a wider response range and racketball can be played at 100mph or a more relaxed pace. See the short video below! The Heswall Mens First Team 2015 - 2016 with Team Sponsor, Seb Gardiner of Quality Freight. Click here for Membership details!